Surface Movements Mt Maunganui was a live, participatory performance event in which surf lessons were offered free to the public. Two lessons of 50 people each were held at Mt Maunganui, 22 February 2014, 11.00am-1.00pm and 2.00pm-4.00pm. The surf lessons were 2 hours long, involved technique, stretches, and surfing. The huge surf lessons involved collaboration with the Hisbiscus Surf School (Mt Maunganui) and the Kiwi Surf School with guest big wave surf instructors Miles Ratima, Doug Young and artist Alex Monteith. The participants wore customised red Surface Movements rash vests, and the instructors were supplied with flourescent green customised Surface Movements rash vests. Prior to the event, the 60 customised rash vests were installed in the exhibition Big Wave Aotearoa at Tauranga Art Gallery, Tauranga. These were removed from the gallery to be used in the live action surf lesson Surface Movements on the 22nd Feb 2014. After the event, the used rash vests were re-installed in the gallery. 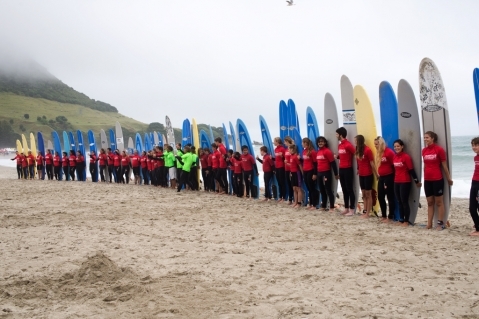 Between the technique session on land, and begining the surfing lesson in the sea, all of the participants and surf instructors performed a circle of rememberance, holding 1 minute silence at the water's edge, for the Rena Disaster, Astrolabe Reef 2011. Surface Movements Mt Maunganui was one of three parts of the Big Wave Aotearoa exhibition held at the Tauranga Art Gallery, Tauranga, Aotearoa New Zealand 2014. Big Wave Aotearoa was curated by Penny Jackson, and installed a large body of surfing action works, the new performance project Surface Movements Mt Maunganui, and the video installation Big Wave Aotearoa 2013-ongoing. Surfer participants names to follow. Big Wave Aotearoa, a project publication with essays by Amelia Jones & Hanna Scott is available from DDMMYY.